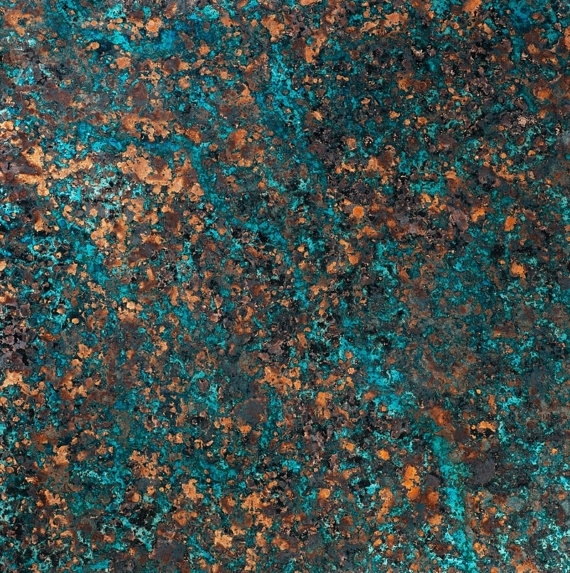 Copper Patina Sheet, 36 gauge, in the color "Majestic Topaz".......Bubbles of intense topaz and turquoise blue, black and copper-brown set the stage for this incredible Patina. Not to be missed! ~As these sheets are hand made from genuine copper, no two pieces are the same. Expect variations of color density and pattern. Sealed with a light lacquer coating, which brings out the best of the Patina as well as protects it. You can add additional layers of spray lacquer to further protect the finish. ~36 gauge copper patina sheet can easily be cut with scissors or a hobby knife and a straight edge. You can also use paper punches to cut out shapes!! ~Need a size not listed? No problem! Just click the custom request button or send me a convo; I would be happy to make a custom listing, just for you! ~Copper Patina Sheets are PERFECT for layering over any of our cuff bracelet blanks! You can also use this versatile copper sheet for inlay work, decorating wooden boxes, cut out shapes and use as jewelry components and more! ~Please note: This is genuine copper sheet, cut to size. Edges may be a bit sharp, handle with care.